eso/es Dashboard is a state-of-the-art information display instrument. 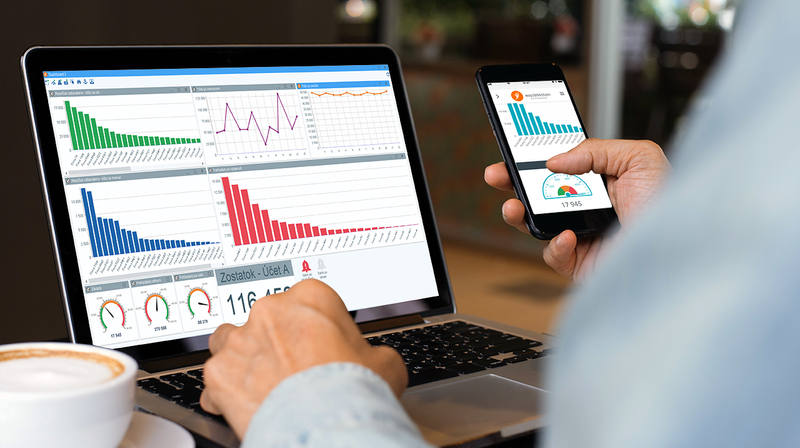 Easy to customise, this control panel is readable at a glance and will show you all you need to know about your company’s condition in a single window guiding you towards making the right decisions. You can easily configure your own views, indicators and alarms to monitor key values and indicators (KPIs) in either text or graphic form. An alarm is a “stand-by” agent that lights up when the set condition is met, just like the dashboard of your car. The indicator shows the status of your receivables. When too high, click on it to display the overdue ones in descending order, for instance. The indicators show various enterprise KPIs (Key Performance Indicators). Any unsatisfactory values will appear in a red field or an alarm will blink next to them. Another view can be a graph showing the current goods shipment status by product volume or by customer, for instance. You can set the indicator to display the daily shipping plan so that you can monitor how it is fulfilled throughout the day. Alarms at regular and adjustable intervals can monitor any type of event or process. For example, requests to approve incoming invoices or solve problems in production and supply plans. Other possible uses of alarms: highlight orders with past dates, deadlines PDV cannot meet, changed dates - plan, changed dates - capacity, insufficient amounts as of a specific date, capacity overflow, capacity underutilisation, planned overproduction, orders for less than the minimum amount, deadlines shorter than the delivery time, etc. You can also set a chart to display the daily invoicing over a specific period. If there is something wrong, you just need to click on the graph to get the list of issued invoices from which you can choose the one(s) you need to edit. Dashboard can be set as a fixed part of eso/es desktop or it can appear on eso/es main screen right after logging into it. You may have several dashboards and share them with other users. There are many ways how you can use eso/es dashboards. All depends on your needs and your imagination :). This is an excellent example of how your information system can increase the productivity of your enterprise.